The differential grasshopper is the largest economically important species. It is 1-1/2 to 1-3/4 inches long, yellowish, with brown and black markings and distinct chevron-like black markings on the hind legs. The adults of migratory and red-legged grasshoppers are about 1 inch long--reddish-brown above and yellow beneath, with red-tinged hind legs. The nymphs are wingless, but otherwise resemble the adults. The elongated, brown-to-orange eggs (glued together in masses) form a pod in uncultivated soil,usually 1 to 2 inches below the surface. The differential grasshoppers winter as eggs and do not appear as adults until summer. Grasshoppers feed on nearly all cultivated and wild plants. The differential and red-legged grasshoppers prefer luxuriant vegetation, while the migratory grasshoppers prefer sparse vegetation. All three species are found throughout Illinois, but the migratory type is found in greatest numbers in the southern sections. Injurious grasshoppers winter as eggs, which hatch from mid-May in southern Illinois to July in northern Illinois. The nymphs shed their skins several times, reaching maturity in 6 to 8 weeks. The adults continue to feed until fall. when they mate and the female lays eggs. During September and October, a single female will lay several egg pods containing from 15 to 120 eggs. The eggs are deposited 1 to 2 inchess belopw the soil surface in field margins, fencerows, ditch banks, roadsides, and sod land. Hot, dry weather favors grasshopper developmenr. 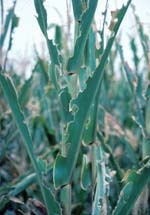 In wet, humid weather, diseases (bacteria and fungi) kill of many hoppers. Grasshoppers are chewing insects that feed from the outer edges of leaves inward. When numerous on corn, they even eat part of the stalk and ears. They attack fresh silks, reducing pollination and often causing the ears to be blank or only partly filled. Even light infestations of 6 or 7 grasshoppers per square yard in a 10-acre hay field will eat as much hay as a cow; 17 hoppers per square yard in a 40-acre hay field will eat a ton of hay a day. All types of field crops, vegetable crops, fruit crops, flowers, and shrubs are subject to attack. Grasshoppers have many natural enemies. Among the more-important ones are flesh flies, bee flies, blister beetles, ground beetles, spiders, hairworms, rodents, birds, and diseases. These long-legged, jumping insects also differ from grasshoppers by having long antennae. The females have a long, curved, nearly sword-shaped, egg-laying tube that distinguishes them from crickets. All katydids are green; crickets are dark brown to black, except for the tree crickets. Both winged and wingless species occur. Katydids so closely resemble grasshoppers they are often called long-horned grasshoppers. They are found almost everywhere, but seldom in large numbers. They feed at night on plants and small animals. Their characteristic chirping sound is frequently heard. Control is rarely if ever necessary.